UHarvest™ Data Management Solution Wins AE 50 Award - Unverferth Mfg. Louisville, KY – February 11, 2014- The American Society of Agricultural and Biological Engineers (ASABE) announces that Unverferth Manufacturing Company, Inc., in conjunction with Raven Industries, Inc., has won a prestigious AE50 award for its innovative UHarvest data management solution, the next-generation grain cart weighing system. Grain carts equipped with load cells are the traditional way to accumulate harvest data. 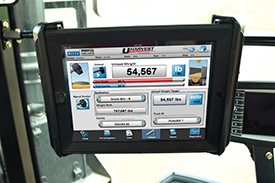 The Unverferth UHarvest data management system, powered by Raven Industries, combines software that allows the user to easily track and analyze as much harvest data as needed with state-of-the-art touchscreen operation and ISOBUS connection. The touch-screen interface offers a quick and convenient way to track the standard grower, farm and field information as well as crop, variety, truck identification and destination of every bushel that moves through the grain cart. The UHarvest system’s AccuSave technology also features a drivetrain sensor attached to the cart for automatically recording each load for data accuracy without the need for operator intervention. The optional cart-mounted moisture sensor records average grain moisture of each load for an added level of management information using a grain cart. Harvest data can be downloaded from either the processor’s USB port to a thumb drive for use on a personal computer, or uploaded with a few touches to a secure Raven Slingshot® web-based server when using a smart phone or tablet with a data plan. This securely stored information can then be used for reporting and sharing with landlords, farm managers, agronomic advisors, crop insurance agents or others. For additional information, please visit www.uharvest.net.